After years of neglect, the Cuban government timidly started to promote international tourism in the mid- 1970s. By the mid-1980s, in the midst of an external sector crisis, the Cuban government embarked in a counter-reform, idealistic economic development program named the “Rectification of Errors and Negative Tendencies” (Mesa-Lago 2000). Along with the abolishment of free farmers markets, a return to moral incentives and the elimination of many of the marketbased reforms made during the late 1970s and early 1980s, the Rectification Process placed an added emphasis on the development of the international tourism industry. The late 1980s saw a rapid expansion of the international tourism sector. Tourist arrivals from capitalist nations increased from 101.5 thousand in 1982 to 310.3 thousand in 1990, while gross revenues from tourism increased from $61.1 million in 1982 to $310 million in 1999. In spite of the impressive performance of the international tourism sector during the 1980s, the disappearance of the Soviet bloc and Soviet subsidies, as well as the counter-reform policies of Rectification, caused the worst economic downturn of Cuba’s history (Mesa-Lago 2000; Roca 1991; Ritter 1988). In an attempt to address the crisis, Cuban authorities announced in 1990 the start of “the special period in time of peace.” During the early years of the “special period,” Cuban authorities concentrated on expanding the export sector (Mesa-Lago 2000). Tourism, rapidly becoming Cuba’s main export industry, was to play a key role. The rapid growth of the international tourism sector continued into the 1990s. In 1999, 1,603 thousand visitors arrived in Cuba, almost five times as many as the 326.3 thousands that visited in 1989. Growth rates during the nineties have also outpaced those of the eighties. While annual growth rates during the eighties averaged 11.9%, the average annual rate of increase during the nineties was approximately 18%. Arrivals accelerated in the later part of the decade, averaging a 21.2% annual increase since 1995, compared to an annual average of 13.8% in the early 1990s (Espino 2000). By 1994, tourism exports surpassed sugar exports, making international tourism Cuba’s top export industry. The tourism sector soon became the star of the “special period.” In recent years, however, the industry has suffered a number of setbacks, posting negative growth in tourist arrivals in three of the last eight years. This paper explores the performance of the Cuban tourism industry in the new century. The international tourism sector in Cuba opened in the new century with a robust performance: almost 1,774 thousand visitors arrived in the island during the year 2000, an 11% percent increase over 1999 (see Table 1). However, the terrorist acts of September 2001 and the security concern experienced by air travelers soon had an impact on Cuban tourism. Visitor arrivals to the island fell dramatically in the last quarter of 2001, and the year closed posting an increase of only 545 thousand international visitors over the year 2000. The continuation of security concerns in the following year brought another dismal performance in the sector. Arrivals in 2002 were down 5% from 2001 and only 5% higher than arrivals in 1999. From 2003 to 2005, the sector seemed to be on the way to recovery, with international arrivals growing steadily. In 2003, visitors to Cuba broke the much-sought-after 2 million arrivals mark; by 2005, over 2,319 thousand visitors traveled to Cuba, a 45% increase over visitors in 1999. While the numbers painted a success story, the Cuban government’s attitude toward the sector took a 180 degree turn and a major shift in policy followed. In February 2004, the Minister of Tourism, Ibrahim Ferradaz García, was replaced by Manuel Marrero Cruz, formally the executive President of Gaviota S.A., a military- operated tourism corporation (Prensa Latina 2004). The replacement of Ferradaz and other high level officials and managers signaled a retrenching of the timid market reforms instituted during the 1990s and the re-centralization and militarization of the tourism sector. It has been reported that during this campaign, Party militants were shown a video where Raúl Castro asserts that “tourism is a tree that was born twisted” (Frank 2004). On May 6, 2004, the Cuban tourism industry received yet another blow as the U.S. government announced tough new regulation on travel to the island. The regulations became effective on June 30 of that year. On October 24, Cuba reacted to the new U.S. policy by announcing that the U.S. dollar would no longer be accepted as legal tender in the island effective November 8. The holding of U.S. dollars was not criminalized but its use prohibited; dollars now need to be exchanged to convertible pesos. A 10% fee was also imposed on each U.S. dollar/convertible peso exchange. In April 2005, the value of the convertible peso, which traded at par with the dollar, was increased by 8%. This measure, along with the 10% fee, effectively raised the rate of exchange to $1.20 per convertible peso (Mesa-Lago 2005). While the 10% exchange fee can be avoided by tourists using other currencies, the 8% revaluation of the convertible peso and the transactional cost (both explicit and implicit) of exchanging currencies into convertible pesos, effectively increased the cost of a Cuban vacation. 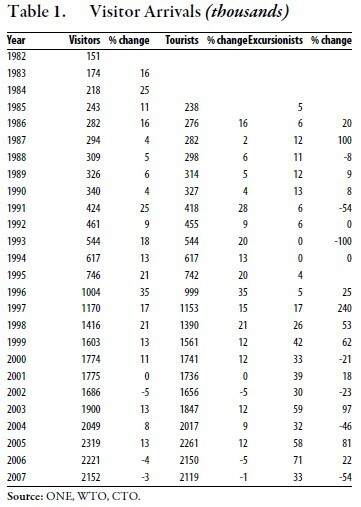 The Cuban tourism sector suffered major setbacks in 2006 and 2007, with international arrivals falling in both years (see Table 1). A closer look at the Cuban tourism industry is needed before determining whether the shift in government policy, higher costs, or other factors are primarily responsible for the recent downturn in arrivals. The majority of visitors to Cuba continue to be tourists, that is, persons whose stay in the island lasts longer than 24 hours. Relatively few excursionists visit the island. In 2007, only around 33 thousand excursionists visited, down from over 71 thousand in 2006, when excursionists made up almost 3.6% of all visitors. The tourist/excursionist breakdown that prevails today in Cuba is quite different from that prevailing in pre-revolutionary Cuba and from the current pattern in most of the Caribbean. During the 1950s, a major portion of the tourist trade to Cuba was excursionists: 90,000 in 1958, 22% of total foreign arrivals. For the Caribbean as a whole, excursionists made up 46% of all international arrivals. The low number of excursionists today can be attributed to the island’s exclusion from the sea-cruise industry as a consequence of the U.S. trade embargo. As long as the embargo is in place, Cuba will continue to be left out of the lucrative Caribbean sea cruise industry. The U.S. embargo prohibits U.S.- based cruises from including Cuba in their itineraries. Cuba’s exclusion from the passenger cruise industry significantly lowers its share of the overall Caribbean international visitor market. In 2007, Cuba’s share of the cruise market was less than 0.1%. The lack of diversity in the type of visitors leaves the Cuban tourism sector with a higher degree of exposure to external adverse economic and security conditions than the rest of the Caribbean. For example in 2002, following the terrorist attacks of 2001, the 2.7% decrease in international tourist arrivals to the Caribbean was cushioned to a large extent by a 7.1% increase in cruise passengers. Without this cushion, Cuba suffered a 5% decline in visitor arrivals. Cuba’s share of Caribbean tourism has increased steadily, from an average of 3% during the 1980s to a high of 10.18% in 2005 (see Table 2). It fell to 9.34% in 2006. This is still less than half of what it was during the 1950s. It is unlikely that Cuba’s share of the Caribbean tourism market will reach pre-revolutionary levels as long as the U.S. trade embargo and travel restrictions remain in effect. U.S. citizens currently are prohibited from traveling to Cuba for pleasure. This denies Cuba access to the U.S. travel market, though the U.S. is its “natural partner.” The U.S. is, in fact, the principal supplier of tourists to the Caribbean area, though its predominance in the Caribbean market has been declining. In 2007 the U.S. supplied 52% of all visitors to the Caribbean, down from around 60% during the 1980s (Espino 1994). U.S. policy restricting pleasure and business travel to Cuba has forced Cuba to seek alternative markets. Since the 1980s, Cuba has been successful in attracting tourists from Canada and Europe. This is still the case today, with these two markets accounting for 73.6% of all international arrivals to the island in 2007. 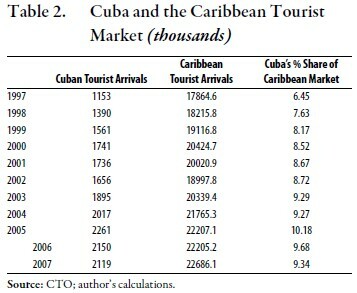 A closer look at the Cuban tourism market reveals important changes in the origin of tourist arrivals (Tables 3 and 4). The country generating the highest number of visitors to Cuba by far is Canada. In 2007, over 660 thousand Canadians visited Cuba. The number of Canadians visiting the island has more than doubled since 2000, when about 308 thousand Canadians traveled to Cuba. Cuba’s reliance on the Canadian market has also increased significantly during this period. In 2007, 30.7% of the total number of visitors to the island were Canadians, compared to only 17.3% in 2000 and 14.8% in 1997. This increase in the number of Canadians visiting the island can be attributed to two factors: an overall increase in Canadians choosing a Caribbean vacation and an increase in Cuban tourism’s competitiveness in the Canadian market. Buoyed by a strong economy at home and an appreciating Canadian dollar, Canadian vacationers have been flocking to the Caribbean in record numbers. Since 2002, Canadian arrivals to the Caribbean increased at an annual average rate of 10.4%, compared to an annual average of only 3.6% of total tourist arrivals to the region (CTO 2008). While Cuba has no doubt profited from the strong growth in Canadian travel to the Caribbean region, there is also evidence of an increase in Cuban tourism’s competitiveness in the Canadian market. Cuba’s share of the Caribbean market for Canadian tourists has increased significantly, from 25.4% in 2000 to 31.7% in 2007 (Table 5). The last two years, however, seem to indicate a retrenchment in Cuba’s competitiveness in the Canadian/ Caribbean market. Cuba’s share of this market peaked in 2005, when Cuba attracted more than 1 of every 3 Canadians vacationing in the Caribbean (a share of 33.5%) and has been declining since then. Significant also was Cuba’s inability to attract Canadian tourists redirected from hurricane-impacted Cancún, who seem to have chosen the Dominican Republic as an alternative. During 2007, the number of European visitors to Cuba numbered over 924 thousand, a decrease from the over a million European visitors in 2005 and 2006. While Europeans still made up over 42.9% of all Cuban tourist arrivals in 2007, this percentage has been decreasing since 1998, when almost 56% of all tourists to the island were European. The new century has seen not only a decrease in Cuba’s reliance on the European market, but also a shift with regard to the individual countries in Europe supplying tourists to the island. Throughout the 1980s and 1990s, Germany, Italy and Spain were the largest European suppliers of tourists to Cuba.1 A previous study found, however, that while throughout the 1990s, Cuba increased its share of Europeans traveling to the Caribbean, it simultaneously lost market share with respect to the German and Spanish markets (Espino 2000). Cuba was able to compensate for loss of share among its top suppliers by diversifying toward other European countries, attracting an increasing share of tourists from France, the U.K., and the Netherlands, who traditionally preferred to vacation in their former Caribbean colonies. These trends seem to have continued into the new century. While Cuba’s share of the total European tourist market is only down slightly from 2000 (see Table 6), Cuba seems to be losing ground in attracting tourists from the three largest European suppliers of tourists to the Spanish-speaking Caribbean: Spain, Italy, and Germany. In 1997, these three countries supplied 34.4% of all tourists to Cuba; by 2007, this share was down to 17.2%. The number of Germans visiting the island has being declining since 2004, and that of Italians since 2005, while the number of arrivals from Spain started to decline in 2001, recovered in 2004 and 2005, and has been declining since then. Since 2003, either France or the United Kingdom has been among the top three European countries supplying tourists to Cuba. In the last three years the United Kingdom has led Europe as the country generating the largest number of tourists to the island (see Table 4). The number of French tourists, however, has been declining since 2004 and tourist arrivals from the U.K., while increasing through the decade, were actually down in 2007. To make up for the fall in tourists from the large European markets, Cuba has turned to smaller markets. Success in attracting tourist from the smaller European countries has been spotty at best: arrivals from Switzerland, Portugal, the Netherlands, Belgium, and Austria increased, showing promise in the early 2000s, but have been down for the past two years. The only Western European markets showing increases through 2007 are Denmark, Norway, and Ireland. Cuba is also attracting a growing number of tourists from Poland and the Czech Republic. Not surprisingly, given recent tightening of relations between the two countries, Russian visitors to Cuba more than doubled from about 14 thousand in 2000 to 29 thousand in 2007. The current trends do not bode well for Cuba’s competitiveness in the European tourist market. This conclusion is reinforced by Cuba’s inability, as in the case of the Canadian market, to gain market share from European tourists redirected from hurricane-impacted Cancún (see Table 6). • Full-time professionals traveling to attend professional meetings or conferences organized by international organizations and institutions who regularly sponsor similar meetings in other countries. OFAC also regulates the amount and type of expenditures that travelers can incur in the island. Traveling to Cuba without the cover of a license, whether general or specific, is illegal under U.S. law and the traveler is subject to fines and other penalties. Nevertheless, a fair amount of illegal travel to the island by U.S. citizens and/or residents occurs every year. Illegal travel takes the form of fraudulent use of licenses, unauthorized travel through third countries, and sea borne visits by boats and yachts. U.S. regulations on travel to Cuba, for example the ease of acquiring licenses, interpretation of authorized activities (e.g., what constitutes a family visit), and the amount of expenditures that is allowed, change periodically. The enforcement of the rules as well as the severity of the fines and penalties have fluctuated through time as well. These changes in rules, interpretation, and enforcement have had an effect on the number U.S. travelers to Cuba, both legally and illegally. 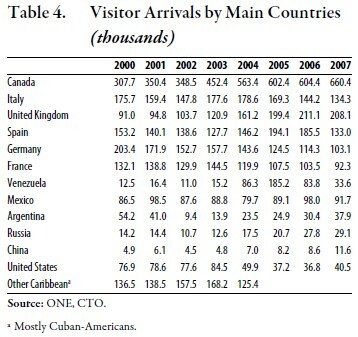 In 2007, Cuba reported that 40.5 thousand visitors from the U.S. traveled to the island (see Table 4). This number, however, includes neither U.S. citizens traveling to the island illegally nor the bulk of Cuban-Americans on family visits who travel with Cuban passports. In 1999, when the reported number of visitors from the U.S. stood at 62.3 thousand, Cuban officials alluded that the visitors figure included U.S. citizens and that in addition, “over 100,000” Cuban-Americans visited the island (Rice 2000). Others estimate that 153,000 visitors from the U.S. legally visited the island in 1999, while an additional 28,000 traveled in violation of U.S. law (Amberg 2000). While American tourists traveling to Cuba without a license and Cuban-Americans traveling with Cuban passports are not included in the official statistics as originating in the U.S., both groups are included in Cuba’s total visitor arrivals. 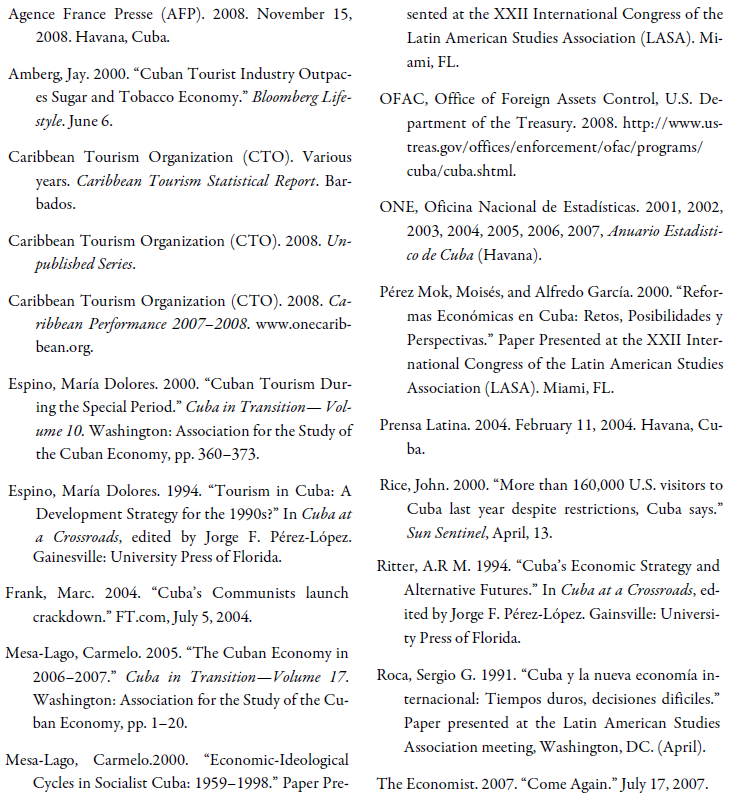 Cuban-Americans (along with other Cuban nationals residing outside the island in places other than the U.S.) traveling to Cuba with Cuban passports are categorized as “other Caribbean” (see Table 4). Though not all visitors in this category can be assumed to reside in the U.S., summing a portion of it to the official U.S. category makes the U.S. at least the third largest supplier of visitors to Cuba (if not the second largest) from 1999 to 2004. Cuban- Americans in family visits traveled in record numbers to Cuba in 2002, 2003, and the first half of 2004. Their numbers counterbalanced the decreases in visitors from other sources due to security concerns following the terrorist attacks of September 2001. In June 30, 2004, the new U.S. restrictions on travel to Cuba mentioned above came into effect. While the new rules reduced the ability to obtain licenses for all categories of travel, the largest number impacted were individuals traveling on family visits, almost exclusively Cuban-Americans. Whereas before the restriction “family” was liberally interpreted, the new rule restricted travel to immediate family (parents, spouses, children and siblings). Before the restrictions, visits were allowed once a year, but with the new restrictions in place, family visits are restricted to once every three years. The impact on the number of visitors traveling to Cuba from the U.S. had an immediate impact. In 2004, Cuba officially reported a decline in the category of visitors from the U.S. of 34.6 thousand visitors. The decline in the “other Caribbean” category was of 42.8 thousand visitors. The reduction in total visits by U.S. citizens and residents in the second half of 2004 can be calculated at approximately 77.4 thousand visitors. Among Latin American countries, Mexico is the largest supplier of tourists to the island. In 2007, 91.7 thousand Mexican tourists visited Cuba. Mexico is also one of the most reliable markets for Cuba. After increasing steadily during the 1990s, arrivals from Mexico have averaged about 90 thousand per year, exhibiting little fluctuation. The second largest Latin American market for Cuban tourism is Argentina. Almost 40 thousand tourists from Argentina visited the island in 2007. Though the number of arrivals is down from the 54.2 thousand Argentines that visited Cuba in 2000, arrivals have been recovering from the downturn caused by the Argentinian economic crisis. The third largest supplier of tourists from Latin America in 2007 was Colombia, providing 18.6 thousand tourists. The Colombian market has been improving since 2002, but it is still down from 2001. With the exception of Venezuela, arrivals from other countries in Latin America have not been significant. Venezuela represents an interesting case. While from 1990 to 2003 the average number of tourists to Cuba from Venezuela in any one year was 11.8 thousand, arrivals shot up to 86.3 thousand in 2004. During 2005, the number of arrivals from Venezuela reached 185.2 thousand, but fell to 83.8 thousand in 2006. This anomalous pattern in arrivals from Venezuela is due to “Operación Milagro,” part of the cooperation agreement between Cuba and Venezuela that consists of flying in Venezuelans to Cuba to receive free medical care, particularly eye treatment and surgery. While these numbers are not expected to be sustained (arrivals from Venezuela were to 33.6 thousand in 2007), they significantly inflated the total arrivals numbers during 2003–2005. Cuba receives very few visitors from other areas of the world. For example, in 2007, around 7 thousand visitors originating from Africa visited the island. Arrivals from South East Asia were 4 thousand, while arrivals from the Middle East were only about 2 thousand. Arrivals from these regions have remained fairly constant through the present decade. The number of visitors from East Asia and the Pacific is relatively larger. In 2007, 42 thousand visitors from East Asia and the Pacific arrived in Cuba, a substantial increase from the 27 thousand in 2000. From this region, China was the country that supplied the greatest number of visitors to Cuba. In 2007, 11.6 thousand Chinese tourists visited the island, more than doubling the 4.9 thousand that visited in 2000. The latest statistics available for tourist arrivals to Cuba in 2008 come from the Caribbean Tourism Organization (CTO) and show arrivals for the months of January until August. During the first eight month of 2008, 1,693 thousand tourists visited the island. While this is a strong 13% increase from the like period in 2007, it represents only a 5% increase over like periods in 2005 and 2006. Most of the growth in arrivals in 2008 occurred in the early part of the year. In the first quarter of the year, arrivals were up by 15.2% compared to a like period in 2007 and up by 14.3% in the second quarter compared to a like period in 2007. Data for the first two month of the third quarter show arrivals to Cuba only 8.5% higher than during the same period in 2007. Once again, Cuba seems to have benefited in 2008 from the growing number of Canadians choosing to vacation in the Caribbean. From January to July, the number of Canadians traveling to the Caribbean was up by 17.7% over the same time in 2007, while arrivals from Europe grew only by 1.1%. Canadian arrivals to Cuba during January to August 2008 were up by 28.1% compared to a like period in 2007, while arrivals from Europe increased only by 2.2%. Despite the slow down in arrivals in the second half of the year, Cuban officials have announced that they expect arrivals to reach over 2.3 million in 2008. Following rapid expansion in the 1980s and 1990s, the Cuban international tourism sector has seemingly entered a period of stagnation. While total arrivals seemed to recover in 2003 and 2004, this growth can be attributed to an increase in Canadian tourists and Cuba’s aggressive promotion of visits from Cuban- Americans. When the bottom fell out of the Cuban- American market due to the tightening of U.S. travel restrictions, arrivals in 2005 were kept afloat by Venezuelan flown into Cuba for medical treatment. With the possible exception of the Canadian market, all evidence points to the fact that Cuba’s competitiveness in all major markets has been dwindling. This is probably attributed to two main factors; the low quality of Cuban tourism and increasing prices. Cuba’s tourism industry still has a very low rate of return. Poor food and service keeps tourists from returning (The Economist 2007). While poor quality and low rate of return has plagued the industry from its emergence, Cuba has been able to offset the low rate of return by attracting tourists from new markets. Cuba’s ability to do so might have run its course. The de-dollarization of the Cuban economy, combined with the revaluation of the convertible peso, has made the Cuban vacation a bit too expensive for European tourists, who see their appreciated Euros go further at dollardenominated vacation spots. The future does not look bright for the Cuban tourist industry through the end of the decade. Not only has the island lost competitiveness vis-a-vis other markets, but current global economic conditions are not favorable. The world-wide travel industry is being plagued by the financial and economic crisis as well as volatile oil prices. In mid-November 2008, Cuba’s Vice Minister of Tourism welcomed a plane (an Air Canada flight) carrying traveler number 2 million arriving in Cuba during that year (AFP 2008). Vice Minister Morejón predicted that by year-end, over 2,340 thousand tourists would visit the island, “a record number.” While this would indeed be the largest annual number of international tourists to visit the island, it would represent only an 8.7% increase in arrivals compared to 2005. It would also be far out of track for meeting the 5 to 7 million tourists by the year 2010 that Cuba had forecasted in the year 2000 (Rice 2000; Pérez-Mok and García 2000). 1. The only exception was in 1997, when France supplied more tourists than Germany.